The 2016 Clemson commencement program. Photo courtesy Chenjerai Kumanyika. The Clemson family has work to do in the coming school year. The 2015-16 academic year was a turbulent one, marked by a student sit-in and the refusal of Clemson’s Board of Trustees to rename the iconic Tillman Hall, named for a violent and outspoken White supremacist. At the culmination of the academic year, the cover of the printed commencement program prominently featured Fort Hill, the plantation home of John C. Calhoun. Calhoun was not quite as nasty as Tillman in expressing his views, but he was a far more influential theorist of White supremacy. Clemson’s official Instagram account hosts 1,017 images, as of August 1st, 2016. Its Flickr account holds another 80,000 or so. Many of these images are not suitable for the cover of a commencement program, because they feature specific people or events. Quite a few more depict Tillman Hall. Setting all those images aside, there are, conservatively, hundreds of images of Clemson’s beautiful campus that could be featured on a printed program for an event celebrating the academic accomplishments of Clemson students. Given the preponderance of more suitable images, the plantation photo was an untimely and unfortunate choice. For the past two years, Clemson has grappled with race relations on campus and with acknowledging the role of White supremacy in its early history. In fall 2014, graduate student A. D. Carson launched See The Stripes, a multimedia campaign to recognize the contributions of African Americans to Clemson’s history and development. Meanwhile, Clemson English professor Rhondda Thomas has gained recognition for research that unearths the central role of Black convict labor in building Clemson’s campus. But in December 2014, a Clemson “Cripmas” party, at which White Clemson undergrads dressed like “gangstas,” revived memories of an infamous 2007 blackface party on Martin Luther King, Jr. weekend. This galvanized many of Clemson’s students of color and their supporters into action. In January 2015, a group of African-American students marched across campus and presented the administration with a list of demands. The Board’s Resolution creating this task force made clear our challenge was telling the complete, though imperfect, story of this great University – and that includes the names of our historical campus buildings. It is worth noting that the South Carolina Heritage Act of 2000 clearly states that the authority to change the names of historical buildings rests solely with the South Carolina General Assembly. The Board is bound to comply with existing law and therefore 3 name changes were not considered. Keeping the names of our historical buildings intact ensures important, hard stories will continue to be told and their lessons learned. A building named Tillman Hall does not celebrate Tillman's views but serves as a reminder to all that Clemson's history is complex and of where we have come as a university and a nation. One task the task force did accomplish was creating more signage around campus to commemorate African-American contributions to Clemson’s history. These included banners on lampposts in front of Fort Hill, the plantation house John C. Calhoun built with profits from slave labor and left to his daughter, who married Thomas Green Clemson, for whom the university is named. Bananas deface a banner celebrating African American heritage at Clemson. On the morning of April 11th, 2016, one of these banners celebrating African Americans at Clemson was defaced with a bunch of bananas. In the eyes of many students, faculty, and staff, the Clemson administration’s response to this act was tepid and inadequate. Out of ignorance or malice, members of the Clemson community asked what was such a big deal about a couple of pieces of fruit. In an effort to save others the trouble of explaining, over and over again, I tried to explain how the bananas, in this context, function as racist symbols. The defacement and the response inspired another march to Sikes Hall, the university administration building, which culminated in an overnight sit-in, the arrest of five students by Clemson University police, and an eight-day occupation of the administration building steps by a coalition of students, faculty, and staff. Dubbed the #SikesSitIn, the protest ended in a meeting between protestors and administrators to discuss the protestors’ demands and a timeline for accomplishing them. It is too soon to gauge the impact of this meeting. However, the sit-in and the meeting did result in Clemson’s president outlining, for the first time, a specific timeline and individualized accountability for the administration’s response to student concerns. Through these events, Clemson joined other universities in grappling with historical legacies of slavery and racism that continue to shape campus realities today. This past fall saw similar struggles at the University of Missouri. Later, as protestors sat on the steps of Sikes Hall, a similar effort was underway up I-85 at Duke University, under the mantle of “Dismantle Duke Plantation.” Then, less than a week after the Sikes Sit-In ended, Yale University was convulsed by the news that its administration would not change the name of Calhoun College, named for the same John C. Calhoun whose plantation home sits at the heart of Clemson’s campus. Protests ensued, and suggestions for new names for the college abounded. All of activity this provides the backdrop for Clemson’s 2016 spring commencement, where an image of Calhoun’s slave plantation home adorned the cover of thousands of printed programs. There are literally hundreds of other images that could have been on the front of the commencement program. But by choosing to feature Calhoun’s planation, the program risks giving the impression that Clemson is doubling down on its connection to White supremacists during a season of heated racial tension. 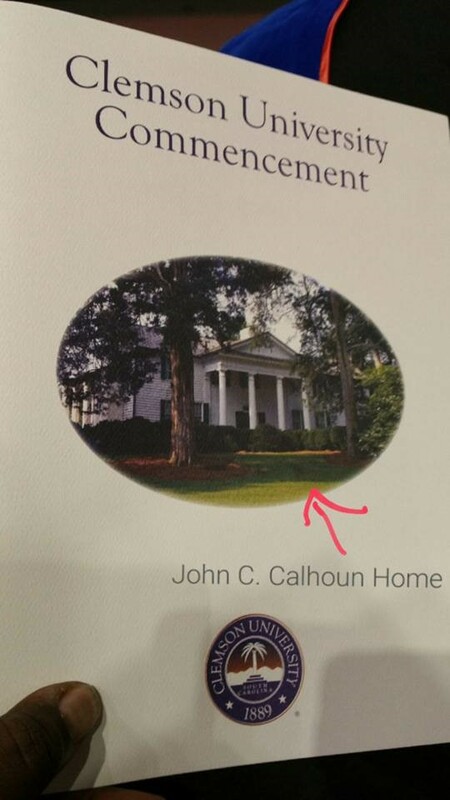 There are two possible explanations for how the Fort Hill slave plantation ended up on the cover of the commencement program. One is that it is a deliberate effort to communicate a vision of Clemson as a place for people who share, or at least don’t mind, Calhoun’s views on race. This explanation is unlikely, for any number of reasons. For one thing, maintaining a museum of 19th century ideology is clearly inconsistent with the administration’s vision for Clemson University in the 21st century. The other explanation is that this was an accident or an honest mistake. The physical document of the commencement program existed in draft form and then had to be edited between Monday morning, when candidate grades were filed, and Saturday, when the commencement ceremony took place. There are always a few candidates who do not complete their graduation requirements and are deleted from the program. So, as a material text, the form of the program is fluid until just before graduation. Presumably, someone chose the picture of Fort Hill from a folder of Clemson beauty shots, and someone else approved the final document and sent it to the printer. Producing such a complex document accurately on short order is an accomplishment, and one I respect. But something went wrong this time. I believe that honest mistakes are real, but I think it is worth being honest with ourselves about where they come from. If you surround yourself with people who look like you and think like you, you are more likely to do something that will piss off people who do not look like you. I like to tell my students, many of whom plan to go into writing careers, that if you are producing copy or content, of any kind, and everyone in the room looks like you, you have blind spots that will inevitably lead to (honest) mistakes like this. My guess is that for the Eagles and for Clemson, there were not any people of color involved in producing and approving the calendar and the program, respectively. When you have a homogenously White creative team, you can end up with Fort Hill on the cover of your commencement program and Riley Cooper as your Philadelphia Eagles Black History Month poster child. Diversity cannot cure ignorance. And diversity has many more positive benefits than just helping people and organizations avoid screwing up. But this is a case you can make to people who do not necessarily care about diversity for its own sake, and who need a little convincing. These people are real. They are the ones who claim that only people who are “too sensitive” complain about having to look at a picture of a slave plantation while they wait for their diplomas. The stakes here are real. Honest mistakes are still mistakes, and they still hurt. They also make it harder to change the status quo culture at a place like Clemson. These kinds of honest mistakes create divisions among what the administration likes to call the Clemson family. Moving forward presents a paradox. If the way forward requires making Clemson more welcoming to a greater variety of people, and that in turn requires making fewer honest mistakes, then what’s needed is more diversity among the people making decisions. But, on the other hand, honest mistakes like the commencement program are likely to discourage students, faculty, and staff of color from joining the Clemson family to work on these challenges. The problem, then, seems to undermine its best solution. As a way out of this paradox, I’ll close with a somewhat perverse suggestion. At times, Clemson has been able to let go of parts of its past. From the late 1930s to the early 1970s, the “Country Gentleman” joined the Tiger as Clemson’s mascot. As Scott Rhymer details, the Country Gentleman was a Clemson undergraduate sporting a top hat, purple tailcoat, and cane. The Country Gentleman was discontinued in 1972, “the same era in which the playing of "Dixie" and display of the Confederate naval jack at games was discontinued.” But it might be worth reconsidering what the Country Gentleman can offer Clemson in 2016. I am not in any hurry to have “Dixie” and the Confederate flag return to Clemson game days, and I do not think an undergrad dressed as a caricature of a Southern gentleman is part of the solution either. But this idea of being a gentleman, (and since co-education, of being a gentlewoman) is an important part of the Clemson culture. It is hard to find a community of people more unfailingly polite than the Clemson family. I like to think that this culture of politeness might be a resource that Clemson can use to move forward. As Oscar Wilde may or may not have said, “a gentleman never insults someone unintentionally.” In the context of Clemson, I take this to mean that a gentleman (or woman) takes pains to avoid making honest mistakes that hurt fellow members of their community, and when he (or she) makes such a mistake, he (or she) listens to the person hurt by the mistake and tries to make amends and do better. As long as the idea of being a gentleman (or gentlewoman) remains part of what Clemson teaches and values, it’s worth seeing if we can reimagine the Country Gentleman as someone whose virtues have more to do with listening than with seersucker. If a gentleman (or lady) never offends someone unintentionally, doing the work to prevent so-called “honest mistakes” is part of the job. I sincerely hope that the administration’s efforts to recruit, attract, and retain more diverse students, faculty, and staff bear fruit for Clemson. Their success or failure depends on the kind of culture Clemson can offer. That culture is a function of the students, faculty, and staff who are already here. Reimagining what it means to be a gentleman or gentlewoman in your dealings with people you encounter—or reimagining what real Southern hospitality could mean—might offer some guidance for the challenges facing Clemson University for the upcoming academic year.